World champion Shaun Murphy lost leads of 3-0 and 4-2 as he was beaten 5-4 by Neil Robertson in the quarter-finals of the Northern Ireland Trophy in Belfast. Breaks of 72, 134 and 99 secured the first three frames for Murphy and a run of 133 extended the Englishman's advantage to 4-2. 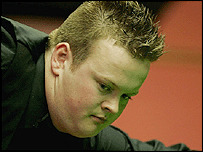 But Robertson hit breaks of 69 and 85 to level and the Australian produced a decisive run of 53 in the final frame. Also in the quarter-finals, Matthew Stevens beat Stephen Maguire 5-2. Stevens claimed victory despite losing his cue tip midway through the fourth frame. At that stage, Maguire led 2-1 but the Welshman went on to win the frame and added the next three with runs of 68, 52 and 47. "My tip has only ever fallen off twice - the first time was against Stephen at the British Open last year, but that time I lost 5-0!" said world number four Stevens, who lost 18-16 to Murphy in the Crucible final in May. "It's good for me to get a couple of results early on because last season I didn't win a match until well after Christmas." Robertson, who now faces Matthew Stevens in the semi-finals on Saturday, was delighted after his comeback win over Murphy. "I was 3-0 down without doing anything wrong, Shaun just potted some great long reds and made some big breaks," said 23-year-old Robertson. "I still felt very good and I had a lot of belief in my ability to get back into the match." Stephen Hendry moved ominously into the final four with a 5-1 win over England's Mark Allen. Allen pegged Hendry back to 1-1 early on, but the Scot then surged ahead to book his semi-final berth. Fellow Scot Alan McManus ended the hopes of local favourite Joe Swail, also winning 5-1. He went 3-0 up before Swail pulled one back, but made a break of 140 in the next frame to reassert his dominance and won the next 96-4.